First published in 1737 this book holds a special place among the tremendous amount of Puritan literature that was produced during that time. Thomas Boston was renowned for his clearly understood English and the manner in which he maintained that clarity while conveying messages of great depth. 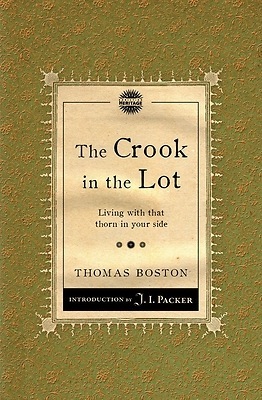 The Crook in the Lot is introduced to us by J. I. Packer. In an extensive prologue he shows how Boston's advice remains deeply relevant today. Boston was not preaching merely from his theological understanding, he was speaking from direct personal experience. Boston had real "thorns" to deal with himself, ranging from his wife's paralyzing depression to his own experiences living for years with what were probably kidney stones. He brings his own unique combination of wonderfully profound and yet immensely practical advice to bear to give us a work of lasting impact.